Unique Moments Photography of Gig Harbor Washington captured this image at a golf course on the bridal walk with the couple. Surprise, its the dip. But it was a fun moment. 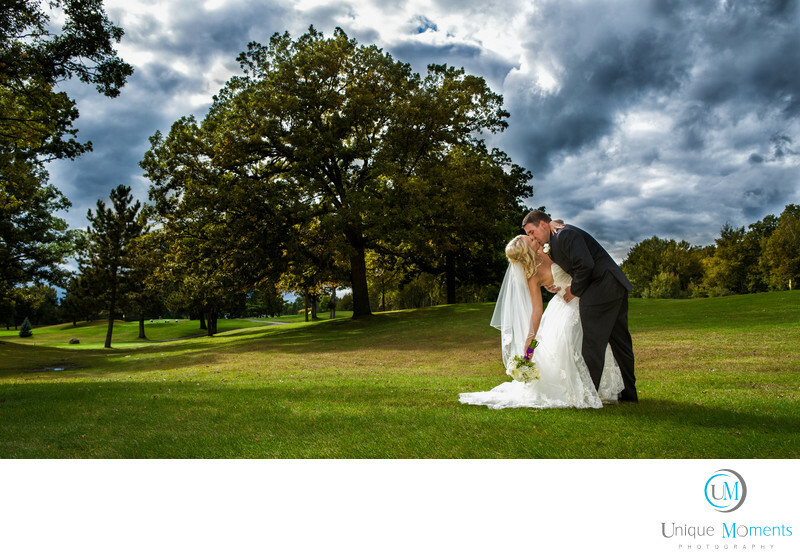 The approaching storm was moving fast and we knew we had to wrap up so we could capture the outdoor bridal party shots.You could hear the thunder and see the lightning coming so we had to hurry and get off that Golf Course. We posed the big group, clicked off some shots and headed for some shelter. It started to rain as we finished and we got rained out for the rest of the day. We barely made it. We call this shot "the calm before the storm". We are convinced this shot never would have happened had we not done this couples engagement session and taught them how to do the pose. Another big reason why we do free engagement sessions with our clients. It really speeds up the wedding day image capture process when clients have an idea to what were are going to do. All we said was "Hey do you two remember how to do the dip". Bam, we were out of there with no time to spare. Location: 5155 McCormick Woods Dr SW, Port Orchard, WA 98367.